Anthocyanins are flavonoid pigments that are responsible for purple coloration in the stems and leaves of a variety of plant species. Anthocyaninless (anl) mutants of Brassica rapa fail to produce anthocyanin pigments. In rapid-cycling Brassica rapa, also known as Wisconsin Fast Plants, the anthocyaninless trait, also called non-purple stem, is widely used as a model recessive trait for teaching genetics. Although anthocyanin genes have been mapped in other plants such as Arabidopsis thaliana, the anl locus has not been mapped in any Brassica species. We tested primer pairs known to amplify microsatellites in Brassicas and identified 37 that amplified a product in rapid-cycling Brassica rapa. We then developed three-generation pedigrees to assess linkage between the microsatellite markers and anl. 22 of the markers that we tested were polymorphic in our crosses. Based on 177 F2 offspring, we identified three markers linked to anl with LOD scores ≥ 5.0, forming a linkage group spanning 46.9 cM. Because one of these markers has been assigned to a known B. rapa linkage group, we can now assign the anl locus to B. rapa linkage group R9. This study is the first to identify the chromosomal location of an anthocyanin pigment gene among the Brassicas. It also connects a classical mutant frequently used in genetics education with molecular markers and a known chromosomal location. Anthocyanins are flavonoid pigments that are responsible for purple coloration in the stems and leaves of a variety of plant species. They have been cited as contributing to protection from photoinhibition , protection from UVB light  and modification of captured light quality and quantity . Additionally, anthocyanins may be involved in metal accumulation. For example, Brassica anthocyaninless mutants show decreased tungsten accumulation  and fail to produce a water-soluble blue compound, likely a molybdenum-anthocyanin complex, in peripheral cell layers upon addition of molybdenum . Anthocyanin-related genes have been isolated in diverse species. AN1 and AN2 encode transcription factors that regulate pigment production in petunia . Pp1, Pp2 and Pp3 contribute to purple pigment in bread wheat . Anthocyanin accumulation in pepper flowers is attributed to gene A, orthologs of which have been mapped in the related Solanaceae species tomato and potato . In the model organism Arabidopsis thaliana, study of anthocyaninless mutants led to the discovery of ANTHOCYANINLESS1 (TAIR locus ANL1), responsible for anthocyanin production; ANTHOCYANINLESS2 (ANL2), a homeobox gene that affects anthocyanin distribution ; ANTHOCYANIN11 (TAIR locus AT1G12910), which contributes to anthocyanin production; TRANSPARENT TESTA 9 (TAIR locus TT9), which is involved in flavonoid biosynthesis, and three other pigmentation genes (TAIR loci AT1G56650, AT5G13930, and LAB). Anthocyaninless mutants of rapid-cycling Brassica rapa (RBr), also known as Wisconsin Fast Plants, completely lack the purple coloration. (Wisconsin Fast Plants is a trademarked name, so we shall refer to them as RBr.) RBr are strains of Brassica bred for short life cycle, early flowering, and ease of cultivation, and are used in science education and research . Absence of anthocyanin pigment in RBr is a recessive trait controlled by the anthocyaninless (anl) locus. The anthocyaninless trait, also called non-purple stem, makes an excellent model trait in monohybrid crosses in genetics education because the trait is easily scored and expressed at all stages of the life cycle . In addition to its use in education, the B. rapa anthocyaninless phenotype has also been used as a marker to assess honey bee pollen deposition patterns  and to evaluate gene flow from transgenic plants into wild relatives . RBr are a valuable tool for "hands on" genetics teaching. Cultivation is simple and inexpensive, and genetic crosses are easy to perform because they are self-incompatible for pollination. Many easily scored Mendelian traits have been identified including anthocyaninless, yellow-green (yellow-green coloration of all leaves), and hairless (lack of trichome on stems and leaves), to name a few. In addition to Mendelian traits, quantitative and polygenic traits are also available. For example, in those plants that possesses a wild type ANL allele, the intensity of anthocyanin coloration is a quantitative trait described as purple anthocyanin (0–9) (Pan(0–9)), which is controlled by multiple modifying alleles [14, 15]. Likewise, the trichome density, or "hairiness," is a quantitative trait affected by polygenic variation. Despite these strengths, the RBr genetic repertoire lacks some important elements. All of the reported RBr mutations have been found to segregate independently of each other, so linkage analysis cannot be done with RBr. Also, none of the RBr loci used for education have been characterized at the molecular level. Therefore, we have sought to add such capabilities to RBr genetics, and our first step is to map the anl locus using molecular markers. Although anthocyanin mutants are studied in Brassica and have been mapped in the related Arabidopsis, the anl locus has not been mapped in any Brassica species. In this study we create a microsatellite marker-based linkage map of anl in RBr. The linkage group may be integrated into known B. rapa linkage groups and used for comparative mapping among related species. Our findings open the door for experiments in linkage analysis and the use of molecular markers with RBr in science education. We tested a total of 138 microsatellite markers for amplification and polymorphism in the RBr test population. Most (122 out of 138) were from B. rapa, but a few from other Brassica species were tested since the sequence homology between Brassicas in the U Triangle allowed for analysis of microsatellites first identified in B. napus, B. oleracea and B. nigra [16–18]. Of the 138 primer pairs tested, 37 amplified a product under our PCR conditions. Of these, 22 were polymorphic in our crosses (Table 1). We further tested these polymorphic microsatellites for linkage to anl. aNumber of informative F2 plants used to test linkage. bNumber of alleles observed among the 177 anl plants constituting the RBr F2 test population. cApproximate allele sizes based on visual comparison to 100-bp ladder on non-denaturing polyacrylamide minigels. We employed an inbred sib-pair design for genetic mapping, and chose plants for genotyping that would maximize the marker information obtained. Because rapid-cycling Brassica rapa strains are outbred, when a cross is conducted between two different strains, a given marker may be polymorphic between some pairs of parental generation plants but not others. Even for markers that are polymorphic between strains, some alleles may be shared. Therefore, after we had identified microsatellite markers that were polymorphic in the Standard Brassica rapa strain (Table 1), we tested them for polymorphism in each of the parental generation mating pairs. From these, we chose six mating pairs that displayed polymorphism for at least one marker. F1 generation plants were grown and siblings were mated (inbred sib-pairs). The F1 sib-pairs were surveyed, and those exhibiting a high degree of marker heterozygosity were chosen for further analysis. These 44 F1 plants (22 F1 sib-pairs) produced 699 F2 plants, of which 177 (25.32%) were anthocyaninless. This ratio is consistent with monogenic inheritance of this recessive trait. The 177 anthocyaninless F2 plants constituted the RBr test population for determining linkage between anl and the 22 polymorphic microsatellites (Table 1). The use of the inbred sib-pair design allowed us to clearly distinguish whether microsatellite bands detected in the F2 generation were identical by descent or identical by state. After we identified markers that were polymorphic in the parental generation, we evaluated each as a candidate for linkage to the anl locus, followed by more detailed linkage analysis of candidates. All primer pairs used for mapping produced bands that segregated from each other as alleles, thus verifying that the microsatellites are single locus markers. We identified the linkage phase between anl and each marker in the F1 generation of each family and then classified anthocyaninless F2 progeny as either parental or recombinant. Three microsatellite markers were candidates for linkage to anl due to significant deviation from a 1:1 ratio of parental to recombinant genotypes. Through two-point LOD score analysis between anl and the candidate markers, we found that each presented a LOD score ≥ 4.6 at distances less than 34 cM from anl. Finally, we used multi-point LOD score analysis with Mapmanager QTX  to assemble a linkage group containing markers Bn9A, BRMS-024b and Ra2-G05 and the anl locus, all with LOD scores ≥ 5.0 (Table 2). In this linkage group (Figure 1), at least one marker is present on each side of anl. The discovery of microsatellite markers flanking anl is important in integrating this anl linkage group into known RBr linkage groups, and for comparative mapping studies. Linkage map of the anl locus in RBr. Map distances (cM) and locus order were evaluated using the Kosambi map function of Mapmanager QTX (p < 0.05, LOD ≥ 5.0) [19, 27]. We also tested all markers for pairwise linkage between markers, but did not find any linkage between those markers not linked to anl. The genetic linkage of anl and Bn9A allows us to determine the chromosomal location of the anthocyaninless gene. 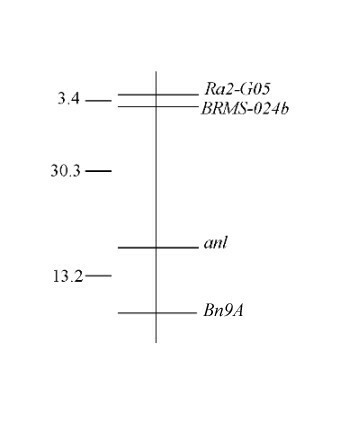 Bn9A has been mapped to a region near the center of B. rapa linkage group R9  (previously referred to as LG3 [21, 22]). Thus, it can be inferred that both anl and the previously unmapped Ra2-G05 are also located on R9. Our data strongly indicate that a polymorphic microsatellite that is amplified with primers for BRMS-024  is part of the anl linkage group (Table 2) which we have shown to be a part of Brassica rapa linkage group R9 by virtue of its member Bn9A. However, BRMS-024 has been found by others to belong to linkage group R1 (G. Teakle, personal communication). Given such results, it is likely that sequences that can be amplified with BRMS-024 primers are present more than once in the B. rapa genome due to extensive intragenomic duplications . Therefore, we refer to the locus that we have mapped as BRMS-024b. Comparative mapping studies allow utilization of B. rapa map data in other crucifers. B. rapa and Arabidopsis thaliana are related by a common ancestor from which they differentiated ~14.5 to 20.4 million years ago . Although markers may be twice as far apart in the larger B. rapa genome , the two species possess many regions with conserved organization; segments as large as 282.5 cM from the B. rapa map are observed in Arabidopsis . A multinational effort to sequence the genomes of Brassica species is currently under way (Multinational Brassica Genome Project, 2007, http://www.brassica.info), including the sequencing of B. rapa linkage group R9 (Korean Brassica Genome Project, 2006, http://www.brassica-rapa.org). Linkage group R9, tentatively referred to as chromosome 5 , is now identified as cytogenetic Chr1 for use in comparative studies with the Arabidopsis chromosomal map . The Bn9A locus on B. rapa Chr1 is located within a region that is conserved on Arabidopsis Chr1 (Korean Brassica Genome Project, 2006, http://www.brassica-rapa.org). Additionally, a small region just below the Bn9A locus in B. rapa is collinear with another region on Arabidopsis Chr1 (Korean Brassica Genome Project, 2006, http://www.brassica-rapa.org). While we cannot yet be certain that anl lies precisely within these conserved boundaries on B. rapa Chr1, the presence of the orthologous anthocyanin pigment gene AN11 on Arabidopsis Chr1 (TAIR accession number 2010356) supports the idea that the Arabidopsis ortholog of anl is located within the conserved regions. We have found the chromosomal location of the anl locus in RBr and identified three molecular markers linked to it. This linkage map of anl in B. rapa represents the first localization of an anthocyanin pigment gene in the Brassicas, and may be used for B. rapa map enhancement and comparative mapping of related species. 138 Brassica microsatellites and their PCR primer sequences were identified from published sources and primer pairs were produced by custom synthesis (Integrated DNA Technologies, Coralville, IA) (Table 3). Nucleotide sequences of primers were obtained from the Brassica microsatellite information exchange of the Multinational Brassica Genome Project web site http://www.brassica.info/ssr/SSRinfo.htm. All primer pairs were tested for ability to amplify a product from rapid-cycling Brassica rapa DNA under a standard set of PCR conditions. PCR reactions were carried out as follows: 1X Accuprime II buffer (Invitrogen Corporation, Carlsbad, CA), 1.5 mM MgCl2, 200 uM dNTPs, 0.05 U/uL Accuprime Taq DNA polymerase (Invitrogen), 40 ng Brassica rapa DNA, 10 pmol forward primer and 10 pmol reverse primer in a total reaction volume of 10 uL. The PCR program was as follows: 94°C for 2 minutes; 24 cycles at 94°C for 30 seconds; 61°C for 1 minute; 72°C for 1 minute; finished at 72°C for 4 minutes. Nucleotide sequences of primers were from . DNA was purified from frozen leaf tissue using Plant DNAzol Reagent (Invitrogen) with the manufacturer's recommended protocol, including the use of polyvinylpyrrolidone to remove polyphenolics. The concentration of DNA samples was assayed using Quant-iT PicoGreen Reagent (Invitrogen). Microsatellite alleles were resolved by non-denaturing polyacrylamide gel electrophoresis. Most PCR products were resolved using minigels (Mini-Protean III (Bio-Rad Laboratories, Hercules, CA)) consisting of 8% acrylamide/bis (24:1) run at 150 V for 60 to 90 minutes. When marker alleles could not be resolved on minigels, they were resolved in large (18 cm) gels (Protean II (Bio-Rad Laboratories)) which consisted of 8% acrylamide/bis (19:1) run at 150 V for 1350 Volt-hours. Gels were stained with SYBR Green Stain (Invitrogen) and visualized with a Molecular Dynamics Storm 860 Scanner (GE Healthcare, Piscataway, NJ). Three-generation pedigrees were used to assess linkage between the anl locus and microsatellite markers. The rapid-cycling Brassica rapa for the parental generation were strains of Wisconsin Fast Plants obtained from Carolina Biological Supply Company (Burlington, North Carolina). The parental generation consisted of a true breeding anthocyaninless strain ("Non-Purple Stem, Hairless," catalog number 15-8812) and a true-breeding purple strain ("Standard Brassica rapa," catalog number 15-8804). One anthocyaninless and one purple plant constituted a mating pair. F1 sibling pairs were then crossed to produce the F2 generation. Before genotyping families, microsatellite markers were screened for usefulness by testing each pair of primers for the ability to amplify a product and identify polymorphism in DNA of a panel of several Standard Brassica rapa plants. Each mating pair in the parental generation was then tested for polymorphism for those markers. When a given marker was found to be polymorphic in a pair of parental generation plants, their F1 progeny were genotyped for that marker. Finally, for each pair of mated F1 siblings in which a given marker was polymorphic and informative, their F2 generation offspring with anthocyaninless phenotype were genotyped for that marker. This inbred sib-pair mating design ensured that alleles from the F2 anthocyaninless test population could be traced to their parental generation ancestor, so that linkage phase of the marker and anl loci would be known. For each marker that was polymorphic within a family, anthocyaninless F2 offspring were assigned a parental or recombinant designation for segregation between anl and the marker. The parental:recombinant ratio was then assessed for deviation from the expected 1:1 ratio for unlinked loci by the chi-square test. Markers presenting significant chi-square values (p < 0.05) were identified as candidates for linkage to anl, and two-point LOD analysis was performed between the marker and anl. Those markers with preliminary LOD scores greater than 3.0 were further analyzed with Mapmanager QTX (Kosambi map function, p < 0.05) to determine marker arrangements and multi-point LOD scores [19, 27]. This work was funded by the National Science Foundation Division of Undergraduate Education grant # 0340910 (USA). The authors are extremely grateful to G. Teakle for advice on data interpretation and for sharing data on the mapping of BRMS-024 prior to publication. CB participated in the design of the study, carried out all breeding and genotyping, conducted analysis of the data, and drafted the manuscript. DW participated in the conception of the project and design of the study, assisted with analysis of the data, and edited the manuscript. Both authors read and approved the final version of the manuscript.